Let's assume that you want to give the user quick instructions on how to use Image Uploader. It is quite difficult to explain to an untrained user what the folder pane is and what the upload pane is. To make it easier, you need to mark the panes of Image Uploader in some way, so that you could refer to them in your instructions. Find a necessary folder in the red pane. Select necessary files in the green pane. Drag them to the blue pane. To color the panes just add the corresponding properties when initializing Image Uploader object as in the code sample below. Color values should be provided either as HTML color codes (hex values), or as names ("white," "red," and so on). You may also add extra borders around panes as on the screenshot above. The idea is extremely simple. 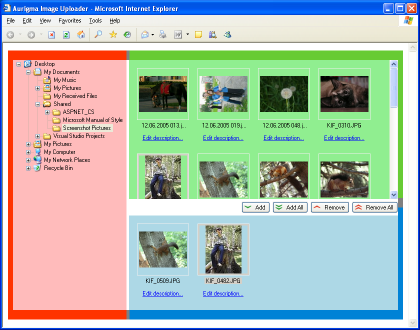 Just put Image Uploader into a table and wrap it with cells of necessary colors. The only problem is to synchronize cell widths and heights when the panes are resized after moving splitters. To handle it correctly you can use the PaneResize event of Image Uploader. Add the event handler, which recalculates cell sizes and applies necessary changes. The completed listing may look as follows.